Today is one of those "perk" days of being a teacher - a snow day! Snow days in my house find me in Minnie Mouse pajamas and Brody spending the day in his PJs too while we play, read, and watch Disney Junior. This particular morning, I made blueberry muffins and fruit for us for breakfast. After eating breakfast, we played with our new Mickey Mouse Clubhouse that Santa brought us a few days ago while watching Mickey Mouse Clubhouse on TV. Disney and breakfast on this snowy day makes me think of the character breakfast experiences at WDW. 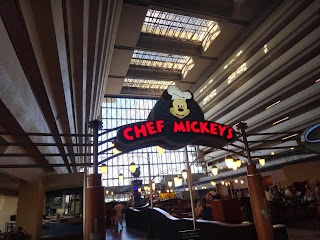 Today I'm going to give my thoughts on one of the most popular - Chef Mickey's! Location - Chef Mickey's is located in the Contemporary resort. On our most recent trip, we stayed at the Contemporary so the location could not be beat for us! I will warn you that if you are staying at another WDW resort that you want to allow plenty of time for a trip to a restaurant in another resort since Disney does not offer resort to resort direct transportation. This means that if you are staying at Port Orleans for example, you need to take a bus to Magic Kingdom and then take the monorail over to the Contemporary. Within the Contemporary, this is an open air restaurant in the hotel atrium. You can hear lots of noise from within the hotel and the monorail so it's not a quiet place to eat, but that worked well for us with a toddler who is not always a quiet guy himself! Food - I feel that all character breakfast buffets are about the same. Food is good - not great. You have your Mickey waffles, fruit, eggs, breakfast meat, yogurt, etc. I don't think that anyone goes to a character breakfast looking for a gourmet meal, but the food is good enough that it won't keep you away. Character Interaction - Chef Mickey's is THE place to see Mickey, Minnie, Goofy, Pluto, and Donald at a character dining experience. While it is great to knock out all of the classic characters in one meal and this will save you lots of time in potentially long character meet lines in the parks, I felt the whole experience was rushed. 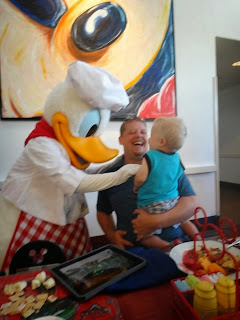 With the exception of Donald, the characters hurried past your table - signing the autograph book, posing for a quick picture, and then moving on. While I'm sure some of this may have been the people working that day, I can't help but also think that some of it has to do with this being one of the busier character meals and that they were trying to hurry diners in and out. I've heard repeated stories about being rushed so I don't feel like it was just us. Despite not being thrilled with the rushed experience, we'll most likely end up back here again - especially with a toddler. Brody knows these characters well and enjoyed meeting them which is exciting to see. I feel it is overpriced at more than $30 per adult, but I don't know that anything in Disney is really a bargain. The nice thing to remember with character buffets is that children under 3 eat free. That's a nice chunk of savings if you're traveling with a toddler and makes the character meals an easier bill to handle. 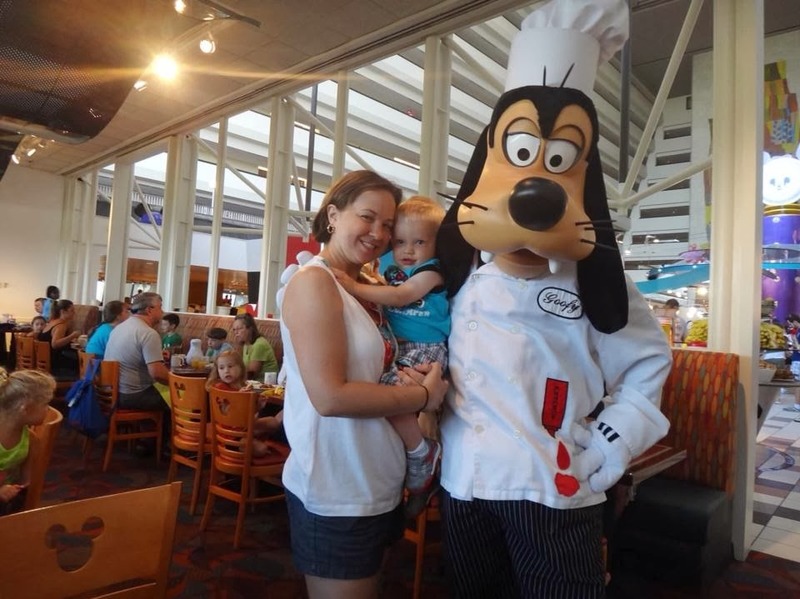 There are other character breakfasts that will save you $5-$10 per person which I liked better (I'll talk about Crystal Palace in another post), but if the classic Disney characters are a must, then Chef Mickey's is for you!